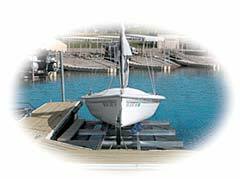 Roll-n-Go’s all new Float Kit is perfect for marinas and deep water applications where in-water boat lifts are impractical or impossible. Take our model 1200 or 2000 and create a floating boat ramp for use with your dock or shore wall. Unlike expensive floating boat lifts, our system requires no outside power source. Its modular design gives it the versatility for many sizes of boats up to 2,000 lbs. — just add more floats. Durable rotational molded floats are filled with closed-cell polystyrene for a long-lasting leak-free life. Just like every Roll-n-Go quality product, the float kit is designed for easy UPS shipping. Now your valuable watercraft investment can sit safely and cleanly out of the water. It’s also protected from the bumps and scrapes that can happen in marinas and other environments with lots of watercraft traffic. 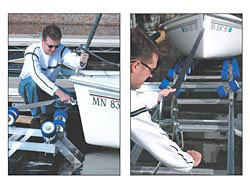 Docking your boat with our float system is just as easy as with any of our shore systems: Just pull up to the end of the system, hook on the strap and crank your watercraft safely out of the water.